Gone are the days when conventional approaches were used for doing business. Today, enterprise web application development can make the entire web portal more enticing. 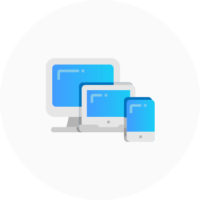 AIMDek serves as a full stack vendor undertaking end-to-end enterprise web application development projects for established market leaders as well as emerging businesses with technology at their heart. Team of experts at AIMDek perform comprehensive evaluation of your project requirements and feasible technology stacks to assist you select the most relevant and appropriate option. We help in defining the project strategy & the roadmap, analyze & clarify requirements and formulate required documentation to guarantee you are resolving the issues and optimizing the actions. A solid proof-of-concept assists you to gauge the feasibility of your concept for implementing it in the real-world and determine the potential of your idea by consuming minimum resources. 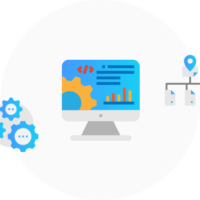 Our project teams establish, configures and manage the entire web application delivery environment and related workflows with a vision to transform your web application into a reliable force for true agility in the cut-throat competitive marketplace. The team at AIMDek acts as an able cross-functional business capability enabler by undertaking complete responsibility from application development to production and vice-versa across the full application life cycle. With proven DevOps approach and using all-round deployment automation, our team manages to ship new applications and features as intermittently as you need to proceed safely on the path of innovation. By offering enticing experiences with open-ended customized projects, we empower enterprises to have a competitive edge in their respective businesses by leveraging software and connected devices. Looking for an intuitive, fast & robust web application? Let’s have a call and discuss your requirement!